Have you ever heard of a "Smash Cake"? 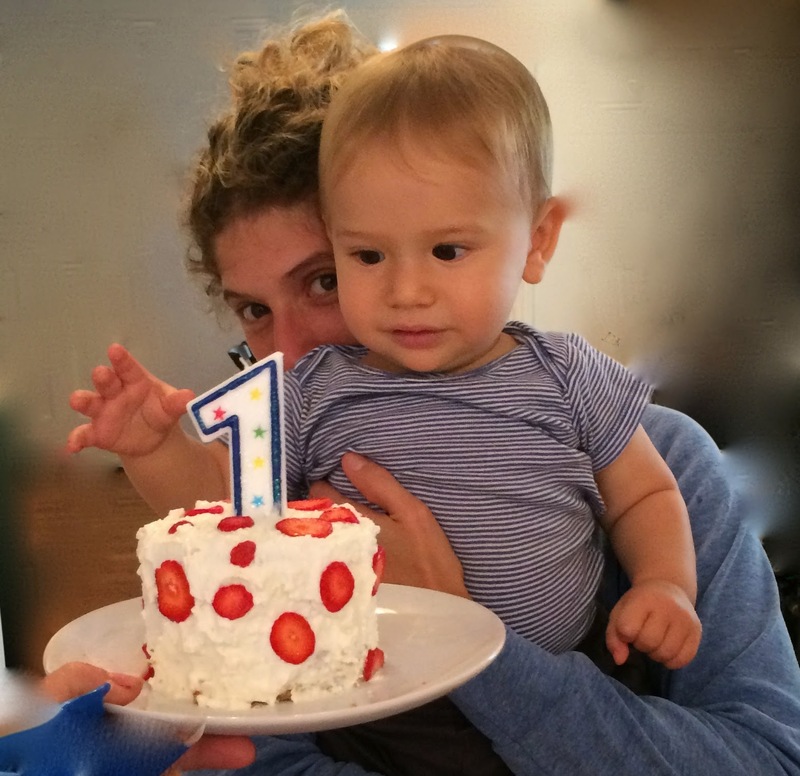 Well, I had not, not until our grandson's first birthday approached, and Ilana requested a healthy version for the baby to enjoy at his party. Google "Smash Cake" and you will find dozens of photos of adorable babies smearing artificially colored, sugary icing into their hair. Sure, the idea is total adorableness, but our healthy baby hasn't had any sugar yet, and nobody needs artificial food coloring, and so we figured out this "cake" for him. It is not really a cake at all, but something like a sugar-free muffin, baked in a sheet pan, cut out into layers, and "frosted" with cream cheese thinned with yogurt. This one has an egg in it, and a bit of butter, but honestly, I'm sure it would be fine with neither if allergies are a concern, because... we are essentially talking about a prop for a photo shoot. 1. Mash banana and add to applesauce, stir in butter and egg. 2. Mix dry ingredients, and stir into fruit mixture. 4. Cool pan on rack. 1 tub of room-temperature whipped cream cheese, thinned with yogurt, formula, or milk, mixed until smooth and spreadable. Spread with cream cheese mixture, top with another disk, more cream cheese, then last disk. The cake is pretty crumbly, so spread it gently. Starting on the sides, cover with frosting mixture, then finally on the top. Decorate as desired with thin slices of strawberries, grapes, or whatever you like.